Welcome to the USCG Auxiliary “AtoN” Federal Short Range Aids to Navigation Program. 1. The focus of the Federal Short Range Aid to Navigation “AtoN” program is on prevention, accuracy, credibility, professionalism and service to the Coast Guard, and is directed toward building the competency level and professional view of the Auxiliary in the eyes of Coast Guard. Guidelines are provided for taking accurate fixes and depths when reporting to a federal agency. These guidelines involve pre-underway and on-scene validation of all measuring equipment used, credible quality on-scene observations and measurements, and for on-line professional report preparation. This activity can take the form of fixes taken with GPS sets using WAAS, depths corrected to the charted vertical datum, physical measurements, photographs and drawings, as necessary, and the validation of all observations to the Light List, the Coast Pilot and a NOAA Nautical Chart. NS-AN01 - ATON PROGRAM HAND OUT –ADOBE – Use this 2-page handout to promote your Federal Short Range Aid to Navigation program with your members. NS-AN02 - FEDERAL SHORT RANGE AID TO NAVIGATION STUDY GUIDE – Adobe – This 56-page guide is full of illustrations and photos of the various Aids to Navigation that are found on a Nautical Chart. The IALA-B Aids to Navigations are depicted along with non-lateral and special aids. Guidelines for taking and reporting fixes and depths are explained in detail as well as the reporting of NS Activity to AUXDATA. Use this guide as a self-training tool and for introducing new members to the Aid to Navigation Team. NS-AN03 - ATON KIT – Adobe - Make this 13-page kit available to the OPFACs in your Division or Flotilla. It is a great reference and training tool of the IALA-B Aid to Navigation System and provides a series of drawings that illustrate the typical discrepancies found on Aids to Navigation. Use this great reference tool while underway. Also, use it to get new members interested in the Aid to Navigation Program. NS-AN04 – 7054 AID TO NAVIGATION REPORT – EXCEL – Use this form for reporting discrepancies observed on Federal and Private Short Range Aids to Navigation to your CG ANT. The fields contain drop down menus and data entry instructions. NS-AN04a AID TO NAVIGATION REPORT - Adobe - Field Explanations - Review the use of each field on the NS-AN04 7054 Aid to Navigation Report. NS-AN05 - BASIC ATON TRAINING PRESENTATION – PowerPoint – is a 83-slide presentation about the basics of the IALA-B System. Use this presentation as a self-learning tool, as the basis of a Federal ATON Training Workshop and/or for training new members in the Aid to Navigation Program. NS-AN06 - ATON DISCREPANCY REVIEW PRESENTATION – PowerPoint – shows every possible discrepancy you may find on an aid to navigation. It is designed for annual reviews of the ATON Program. Include it as part of all your ATON workshops. NS-AN07 - ALL ABOUT BUOYS – PowerPoint – is an advanced 56-slide presentation that builds upon the “NS-AN05 - Basic ATON Training Presentation” above. Use this tool to fill in some more details about Aids to Navigation that will assist the member to become more conversant with Coast Guard terminology. NS-AN08 - EVERYTHING YOU NEED TO KNOW ABOUT BEACONS PRESENTATION – PowerPoint – Use this 87-slide presentation to expand your knowledge of beacons. NS-AN09 – MORE ON BEACONS AND DAYMARKS PRESENTATION (02/17/09) – PowerPoint – Use this 87-slide presentation to further expand your knowledge of beacons. NS-AN11 - PRE-UNDERWAY CHECKLIST FOR ATON/CU PATROLS – Adobe – Use this checklist to prepare your OPFAC before getting underway on an Aid to Navigation / Chart Updating Patrol. This tool will remind you of the various pieces of equipment and set ups that are required to complete an effective and productive event. 3. If the Federal Short Range Aid to Navigation Program interests you, talk to your NS Staff Officers. Each Flotilla and Division is encouraged to check each Federal Aid to Navigation that they pass while underway on an OPFAC. Guidelines are provided to take credit for your underway time and for all your NS Activity in AUXDATA. Generally, you need access to an OPFAC to participate. New members are encouraged to join their local Auxiliary Navigation Systems Team. Your skill, knowledge, and desire to make a contribution to a worthy endeavor are all that is needed. ONLINE 7030 - Click here to fill out your mission hour form to receive credit for your ATON work in AUXData use mission category 30 and submit to your FSO-IS. For PATON's, this capability is now built into the Web-Based PATON Reporting System. What to report about a beacon or Daymark (1/01/08) – Make a copy of this page and keep it aboard your OPFAC as reference. This is a great handout for operationally active members – Word – 1 page. 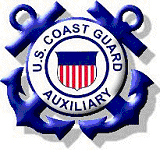 Links to non-Coast Guard entities are not under the control of the United States Coast Guard or the United States Coast Guard Auxiliary, and are provided for the convenience of our customers. They do not, in any way, constitute an endorsement of the linked pages or any commercial or private issues or products presented there. We cannot make any warranty or representation concerning the content of these sites, or secondary sites from the pages to which they link. The D1NR ATON Web Site does not collect information from or about users of its web site through the use of 'cookies' etc. Email links are provided as a means to contact USCG Auxiliary members for additional information or to make comments. The sender's return email address will be used to respond to comments and questions and may be made available to other members of the Auxiliary only for the same purpose.